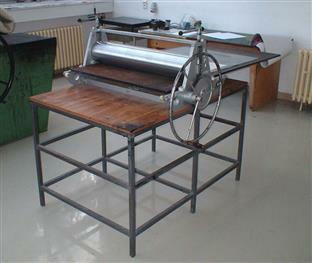 Etching press, Rotogravure presses | Etching press | Jína - obchodní společnost s.r.o. ROTOGRAVURE PRESS - "ETCHING PRESS"
It is been my pleasure that I can offer you quality graphic presses made by my company since 1981. Even in the deep of totalitarianism I have tried to establish my own structures folowing the invention of the rotary presses, rotogravure presses made by Mr. Karel Klíč in 1890 in town called Hostine not far from my company. After many difficulties in the development and production, including two stolen know-how, I think the years of development of my graphic presses are successful. printing, like for example wood cuts, wood engravings and lino cuts. 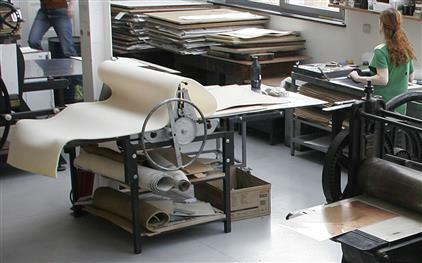 At the request we deliver under the "etching press" - from sizes of the boards 50 x 100 cm and higher - the firm tables with two shelves for putting off paints and papers. The tables have two moving wheels on the block feet and one block foot is vertically adjustable. The tables are enough firm to bear weight up to 300 kg. The weight of our machines ranges from 30 to 150 kg. The press plate is made from high quality plastic called polystone. We replaced the previously unsatisfactory and widely used Pertinax. From the size 40 x 90 cm the lateral line of the board is assured by "silon"(synthetic fibre) rollers. Upper roller is ground and chromium - plated. Thereby it is prevented from whichever wear. The diameter of the roller is 154 mm and its plane runs in some hundredths of mm. Lead screws of the roller have rifling 1 mm, it means that by rotation 1x around you will lift or put down the height of the roller by 1 mm. Optionally you also can divide a millimetre to thirds, fourths and like. 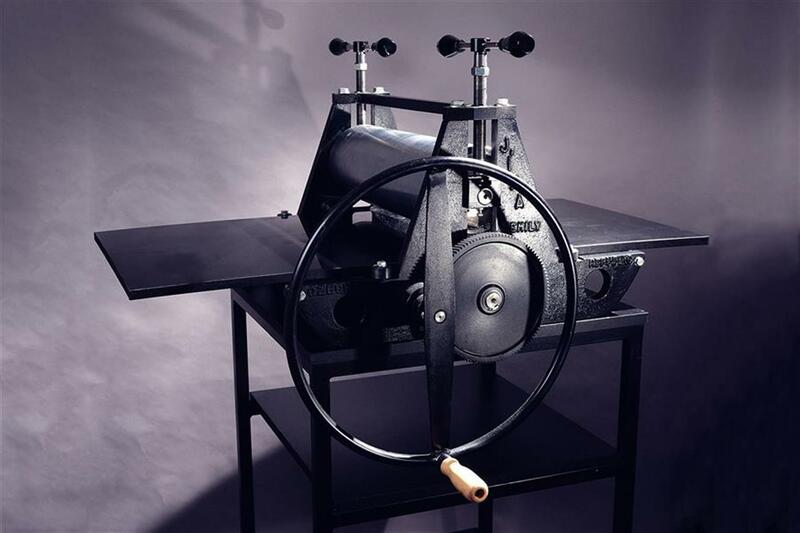 It assures very precise adjusting of the plane of the roller or on the contrary its specific small bevel and thereby different press on the margins of the roller. There are nuts on the screws by which tighten you assure the screws against unwanted indexing and thereby successive change of the press. A big advantage of these screws is the fact that with a small force you put on a high press. It is - along the excellent parameters of the gear drive - very important especially for women and children. Even small children are able to spin a small wheel or a handle without bigger effort at higher presses. 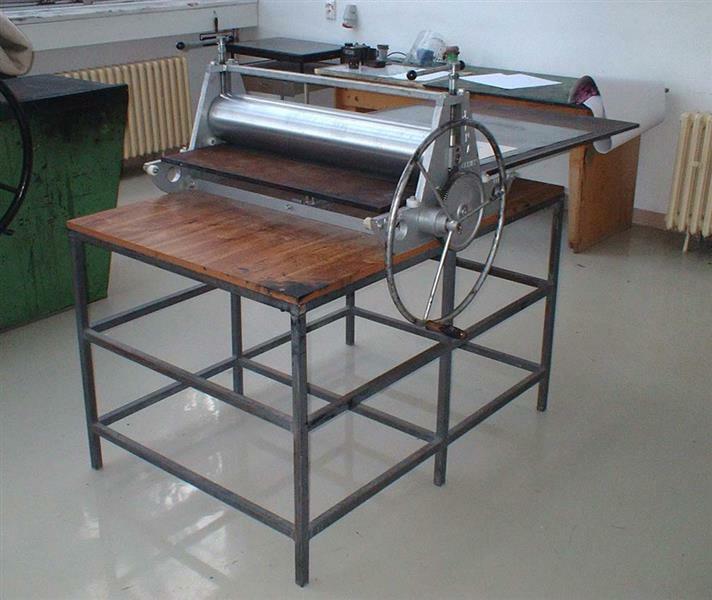 We provide a guarantee for three years, but we believe, that our "etching press"will be good at minimum 20x longer. If you decide to buy our product, we hope, you will be satisfied with it all your life. Based on increased demand, I decided to start producing press with largest measuring 100 x 200 plates cm again after 15 years.This production was preceded by several months of development time and many tests. Even its not obvious, there is new whole construction and has been made more reinforced. Thouse presses doesnt have much in common with smaller presses. I hope many of you my future customers will be satisfied this new product. Another news is a chain transmission. We logically solve the problem with your fingertips to move the other side of the press. For a surcharge, 320,-EU including VAT, we install a chain transmission, which drives the lead screw on the other side of the press. This device we recommend for plate sizes with a width of 70 cm and above. There is no longer a problem for children and older people. 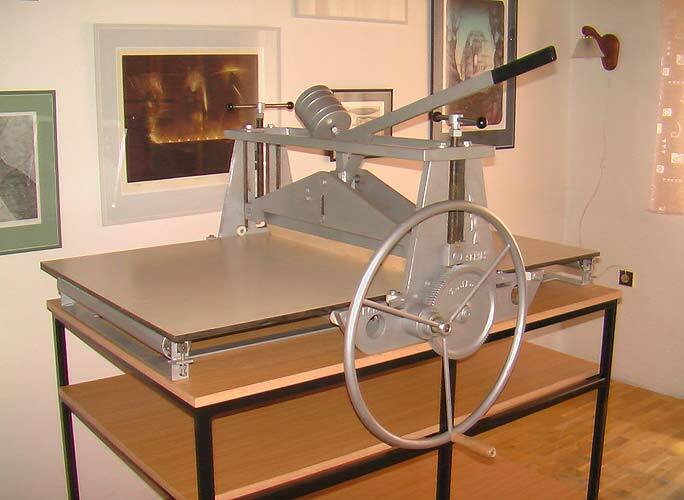 Additionally, you can move the press closer to the wall so there is little more space in room. Additional charge for a wheel at small presses is 185 EUR. Standard color of the presses is silver. Additional charge for customer color is 60 EUR. 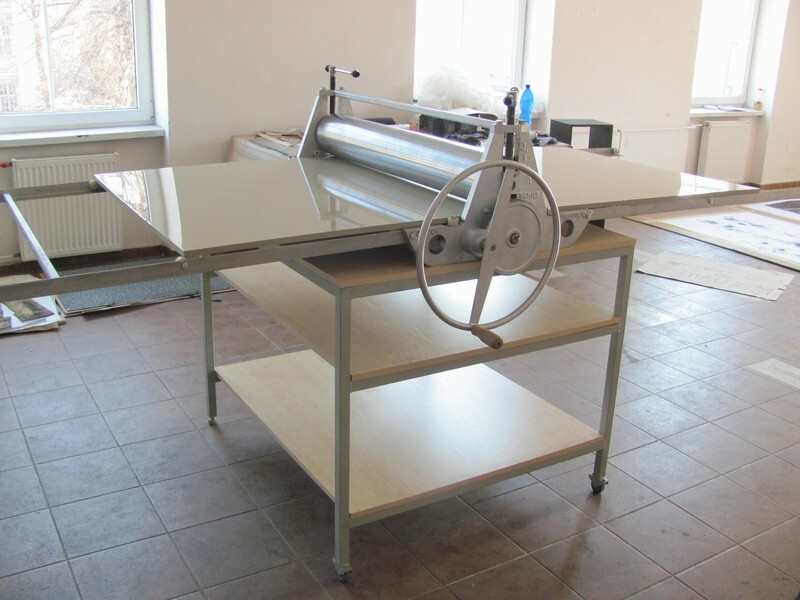 Price of the lithographic press which is for the present produced only with the board with the size 70x110cm is 3 710,- EUR. 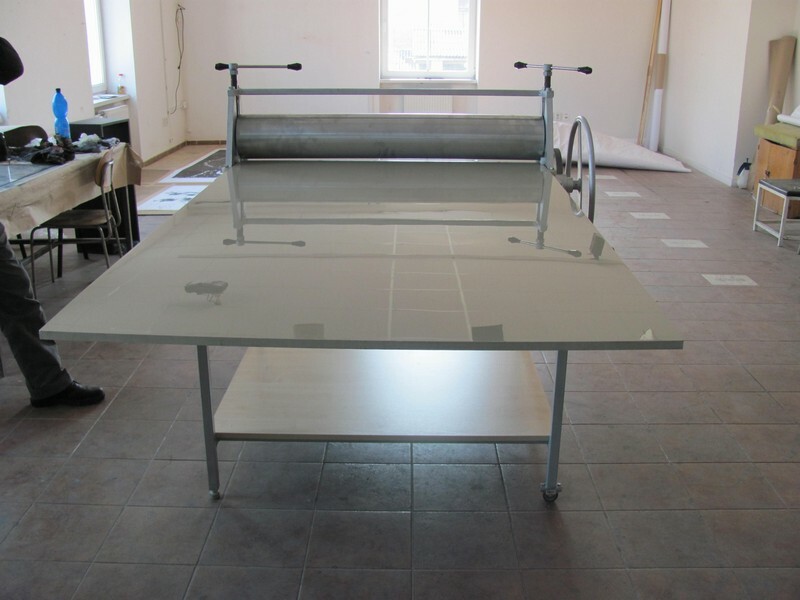 Table for this press costs 340,-EUR. The correct prices are in Czech crowns. Prices in Euro are approximate. Depends on the current euro exchange rate. We recommend either our transport or on your own one, because other forwarders ask for wooden boxes as for wrapping and these boxes are more expensive than the transport itself. Our company is equipped for the transport of the goods without wrapping. We charge 0,50 EUR per one kilometre for the transport. We can divide the whole amount into more invoices at the request. All requests including prices, please, fill in detail in your order. I strongly believe that over 1200 presses made and sold by my company is a guarantee of quality for you and help you with eventual purchase of the graphic press produced by my company. Josef Jína the owner of the company is looking forward to your order. 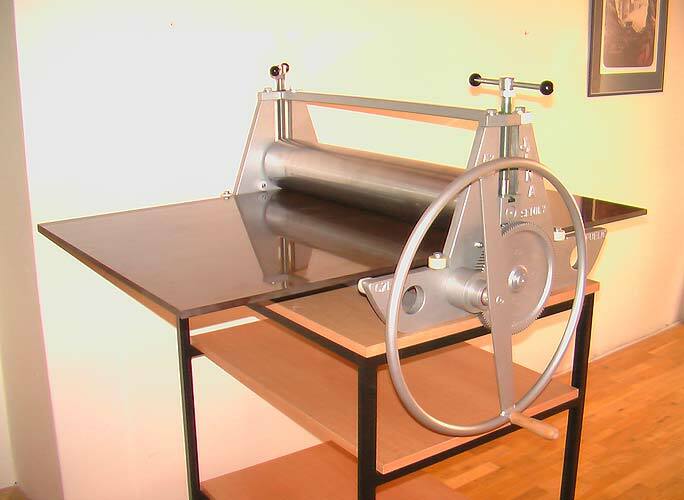 Our press in the studio of the now deceased world renowned painter and graphic artist Mr. Vladimír Komárek. 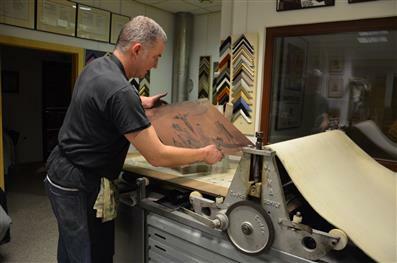 Recommended by his son, the print artist Vladimír Komárek Jr.
Our press in the studio of the Creative Arts Academy in Prague. 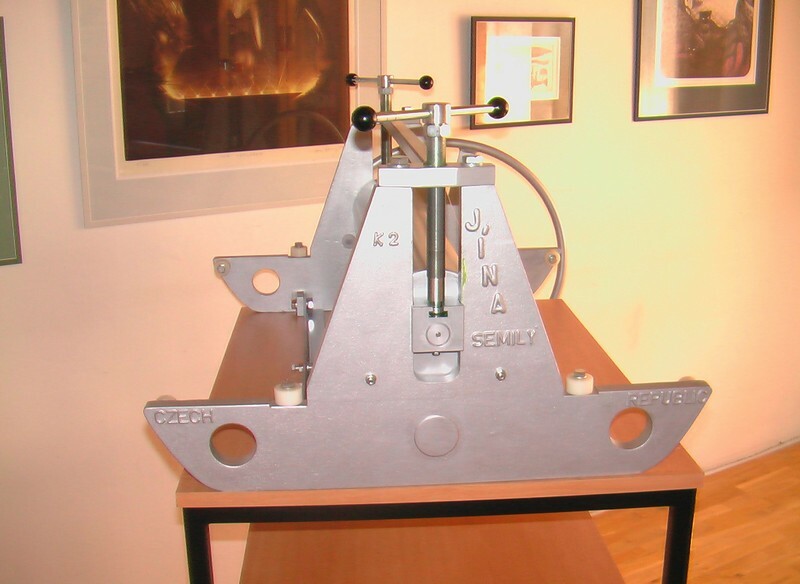 We use these well known graphic presses from Mr. Jína from Semily for printing graphic sheets from depths and heights. 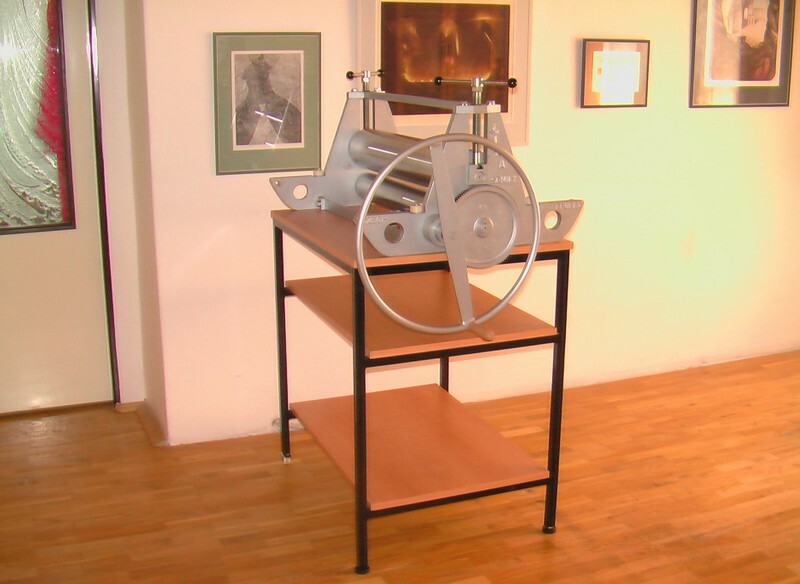 The Creative Arts Academy in Prague purchased this specific photographed press twenty years ago and uses it still today together with several other presses for students. Based on their good experience with it, most of our students purchase it and use it for their art work for their own benefit. Therefore, I am pleased to recommend it. Associate Professor Magdalena Vovsová, Prague. Our press in the studio of Ing. 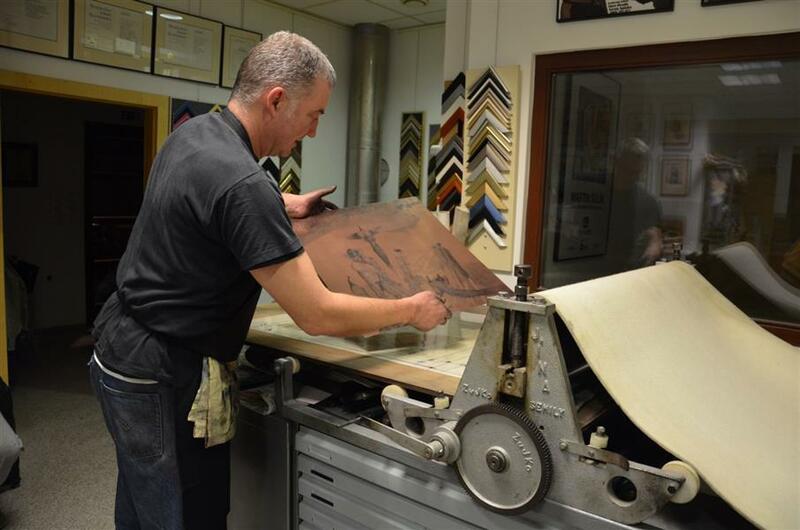 Martin Štěpánek in Nitra: I have been involved in deep printing for more than 20 years, and since the beginning I have always used deep printing presses from Jína ‑ Semily. These machines are used in my printing workshop daily. They do not have any problems, and I am very satisfied with them. I can only recommend them. M. Štěpánek..
Our press in the studio of the Creative Arts University in Bratislava. Four presses have been used here daily for over 20 years. Around 1,000 beginning and advanced young artists have learned to print on them. I recommend them because of their endurance and problem-free operation. I myself have owned one problem-free press for about 20 years. Professor Peter Augustovič, Bratislava.